◙ Quite standard map, but as soon as the players take their thirds it opens quite a bit. GG GL in the TLMC guise! Looks pretty good but imo the colours are too saturated. And sorry about the analyzer pics . nice clean texturing and doodads i have to say, those red crystals fit perfectly. It looks really nice, even better than the last version! 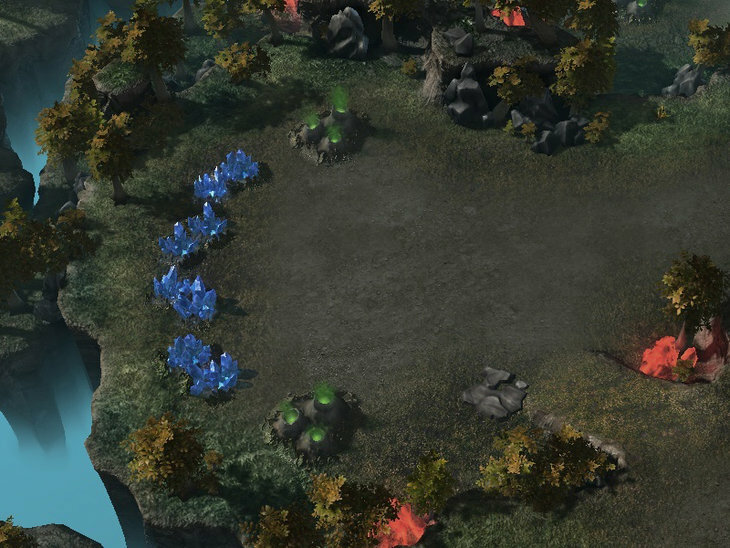 I personally think it'd be better with just 3 bases per corner, but that's just me and my hate for 4 base per corner maps as it limits the reason to ever move your army. Solid map though I guess. I really like the middle! @Meerel yes, the map is quite standard, i had another map (eroded temple) that i wanted to submit for Red Bull but i didn't wanted to rush it for the TLMC and since i had this idea about making an autumn map and i also wanted to improve the texturing in Foresta, why the hell not do a retexturing of a finished map instead? Besides since i don't know how much time Red Bull expects to have the maps being played i think the wiser is to submit more standard maps instead, at least for this first Red Bull TLMC, since most of the less standard maps have a reduced life compared to standard maps because of the gimmicks and how they affect the metagame and stuff, so yeah, i would rather play on Whirlwind a thousand times than to play on Koprulu because even if the first 300 games on Koprulu will be a hell of a fun the next 700 will have a stagnated metagame /imba compositions attached to them (same may happen in whirlwind tho, the difference is that it will happen to a lesser extent). I don't have anything against non standard maps, i have made a few myself, is that for this TLMC i would rather submit something more standard and risk gettin' bitched at by the community than submitting a non standard map and then get the map kicked out because after <500 games it started showing imbalances at the higher levels. @Qikz I take the 4 bases per corner ones, i like them better because they flow better than 3 base ones, in the 3 base ones if you make a rotational symmetry map you have almost for granted that you will end up with a good degree of advantage to one player over another, in the 4 bases per corner that's not so hard to iron out and leaves you with more layouts to play around :3 But this falls into a thing of tastes tbh, and yes the 4 bases per corner tend to be more "static" with the army placement than 3 base ones, that's a problem i think it can be solved out by the layout itself tho, but i'm still thinking a way to do so. I quite like the semi-open area ahead the high ground third , you did a great job there. Unfortunately , i dont like center areas with all those 3 size ramps. I mean , larger ramps are perfect , i love how they are placed. I'm intrigued , which textures/lighting did you use here ? I think you overdid it slightly with the orange crystals. You should delete 50% of them, I think the map would look even better then. The thing with the crystals is that they oversaturate the overview, but in game you will only see two, three at most in your monitor, so yeah, even if it looks oversaturated in the overview ingame looks perfectly fine (or at least that's what i think of it, when i play on the map Example of a natural). 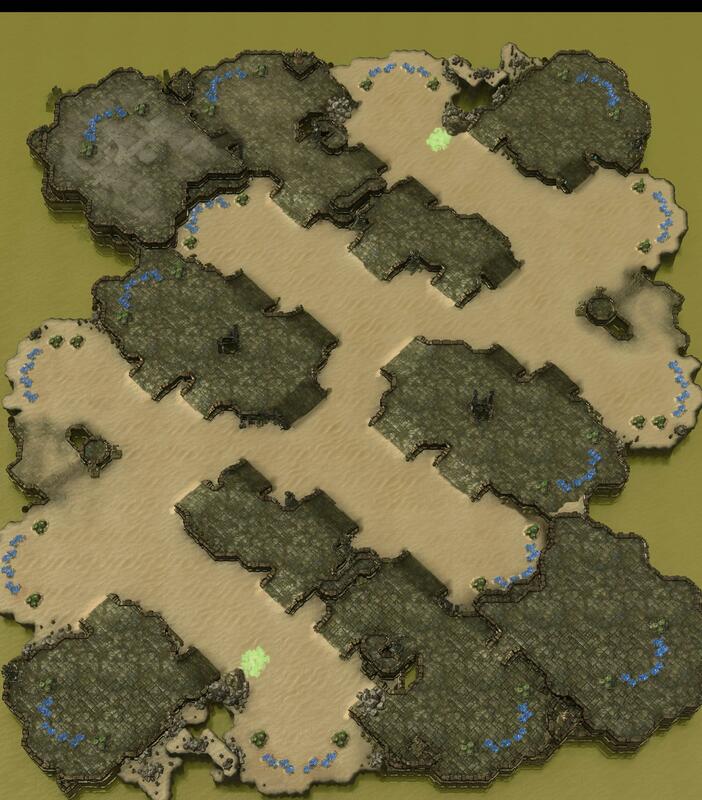 The smaller ramps in the middle play a vital role, they open the center of the map, if those ramps weren't there then the center would be too choked up, and those ramps avoid that, besides of granting a small advantage to the player that holds the middle because with these ramps he can send chunks of his army to harass the enemy. Here are the textures i used. & the lighting is Korhal City.